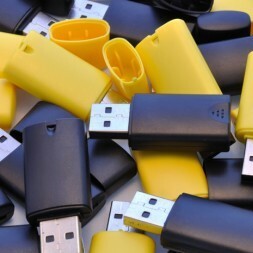 The Twister USB Flash Drive is one of our most affordable and popular promotional USB sticks. The Twister has a rotating aluminium clip which easily swivels and ensures that there is no cap to lose. The clip can be screen printed, engraved or printed in full colour to ensure that even the most intricate company logo is reproduced & branded perfectly. The body of the USB and the clip can be pantone matched to any colour for quantities starting from as little as 25 units. The Twister ranges from 64MB memory size, to our best-selling 2GB memory capacity and then all the way up to 64GB. We have a large range of personalised Twist Style USB Memory Sticks that can all be fully customised with any logo or artwork and we also offer an Express Twister USB for when you need your order to be delivered quickly.